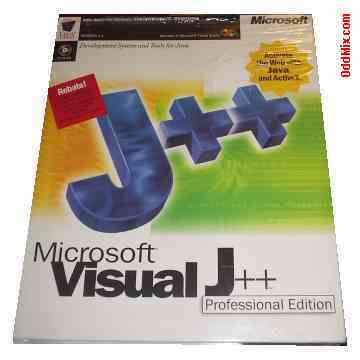 This classic, but highly useful Visual J++ from Microsoft Corporation was one of the the best development tool for Java programs made to run under the Windows Operating System in it's time. Many who used it, or was fortunate enough to buy it in time, before it disappeared still happily using it. This 32-bit Visual J++ development program is a version 1.1 and a Professional Edition. The program comes with two CDs - Microsoft Visual J++ Professional Edition and the Microsoft Development Network Library Visual Studio 97. It also comes with "Microsoft Visual J++ Getting Started", a wall chart titled "Microsoft Visual J++", License, "Visual J++ Resource Guide", and a "Learn Java Now" book and manuals. The manuals explain how to use the program and commands in great detail. First come first serve, only one available. • Weight: 930 [grams] - 2 lbs 07 oz.